I am three, and I’m waking up from my afternoon nap in the right way: Slowly. Contentedly. In my own time and space. I’m in no hurry to open my eyes. The bedroom is dim from the pulled curtains, anyway, and I’ve memorized every sight I would see from my place on the bottom bunk. 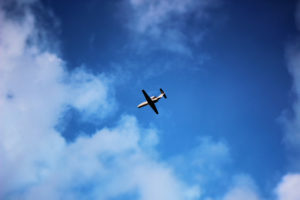 An airplane flies overhead. In our house, below a well-traveled flight path to the airport, it’s a sound as common as a truck roaring by on our busy inner-city street. Whenever the house is quiet and I’m quiet, it seems there’s the sound of a plane somewhere in the sky. The window is open in the bedroom I share with my brother, who, at almost-six, is too old for naps. I can hear the neighborhood kids playing outside. Laughter and shrieking, then protests, complaints. Now the sound of a hose as more water is added to the plastic wading pool in the yard next door. I can picture the blue pool, the grass clippings floating on the glistening water. There’s the voice of the bossiest girl, who is not the oldest but is the most sure of what she wants and how to get it. Just the tone of her voice conjures a snapshot of her hands on her hips, one hip jutted out to the side. My eyes are awake now, primed by scenes my ears have fashioned. I get up, my pigtails lopsided from their time on the pillow, and leave my bottom bunk to follow the sound of humming to my mother. We lived on the ground floor of the house on Walnut Street until I was five. It was my first home. There are photographs to inform my visual sense of that place, but I can’t really claim them as memories. What I truly remember, from deep in some audio file my mind, are sounds. Like the sound of my mom humming. Our living space was small, making it easy for sounds to travel from one room to the next. My mom loves silence, but sometimes I think she loves it because it’s like a blank canvas—an open space for her to hum or whistle into as she folds laundry or chops vegetables. In the house on Walnut Street, her humming was my homing beacon as I navigated the waters between independence and security. Sometimes upon waking from a nap I could hear my grandmother’s musical voice coming from the kitchen—a one-way, joyful conversation that meant an “audio letter” had arrived in that day’s mail. With my grandparents far away in California and long distance phone rates too costly for either household’s budget, my mom and grandma regularly recorded newsy updates on small, table-top cassette players. The tapes were mailed back and forth in padded manila envelopes. My dad’s arrival home each evening was inevitably announced through the stereo speakers: the pop-and-crackle of the needle touching an album. When Dad was home, there was always music playing. Aaron Copeland, Miles Davis, Stephen Sondheim, Bela Bartok, the Beatles, Peter, Paul & Mary—their electrifying, silky, surprising, earthy, and complex notes were the soundtrack of my childhood (the volume always a bit too high for my mom’s taste). During warmer months, the sounds in our home mingled with the sounds of the world outside. In 1970s Michigan, no one had air conditioning—certainly not those of us renting old houses divided into duplexes in the city’s core. We opened windows, turned on noisy box fans, and spent as much time as possible playing outside with water, or sitting on shady stoops. Private lives were aired to the neighborhood: Everyone’s music and arguments, their clattering pots and pans and crying babies, were heard alongside the passing boom of car stereos, loud mufflers, and barking dogs. After being tucked into my bottom bunk each night, the sounds of Walnut Street played on, each sound telling me a story. Some were as comforting and present as the hum of my mom’s sewing machine on the kitchen table; others were as mysterious and distant as another plane in the night sky, its seats filled with strangers traveling who knows where. This entry was posted in Sound & Place and tagged childhood, city, grandparents, home, Lansing, memories, Michigan, music, napping, neighborhood, record player, Silence, sound, urban. Bookmark the permalink. That was a good read, thank you. Eudora Welty (One Writer’s Beginnings) refers to sounds she remembered and that piqued my curiosity and then I found your story and now I’m raring to recall my childhood sounds. It’s lovely to just sit and write about what you love. One more thought here is that we begin to realize that “peace” and security often are transmitted by the sounds little children hear. I wonder now how much sound pollution from really bad TV programs flood the brains of young children even when they are sleeping. TV when YOU were young was so simple and harmless. I never cease to be amazed at all you recall from your childhood, Kristin! I am right back there remembering, too, now. The one noisy sound I remember as unique to that house esp. was the almost daily siren of the fire trucks from the main downtown station only 9 blocks away as they flew past our house! So many times they came as we were sleeping or napping. I didn’t remember that until you mentioned it, but yes! It was like we lived in Richard Scarey’s Busy Town—there was always lots going on. I guess I learned to mostly sleep through all the noise? Summer sounds in particular are what I remember most. The sound of a distant lawn mower or the mid-day baseball game on TV. This lush post reminded me of so many more! Yes! Lawn mowers and baseball games! For me it was the Detroit Tigers, mostly on the radio. And for some reason, I associate those summer sounds with our next home, in St. Johns. Maybe the smaller town/suburban setting cleared away all the urban noise, isolating the sounds of lawns being mowed and mourning doves calling. Kristin, What a fun journey you took us on! I’ve been fascinated as of late with how we experience things with all our senses. It’s amazing your memory conjured up so many sounds. Well done. Thanks, Traci! Writing this made me really wonder about how much sense perceptiveness we lose as we get older. I know I was so much more in tune to sounds as a child. Do most of the sounds in our lives just become commonplace, so we don’t notice them as adults, or do we simply learn to rely primarily on our sense of sight to inform us?